Specify the countries to combine. Project the map and store the projection parameters. Define the title, footnote, and legend for the map.The LEGEND= statement relabels the NAME variable. Produce the choropleth map that combines 3 European countries. The DISCRETE= option generates a separate color for each different response variable value. 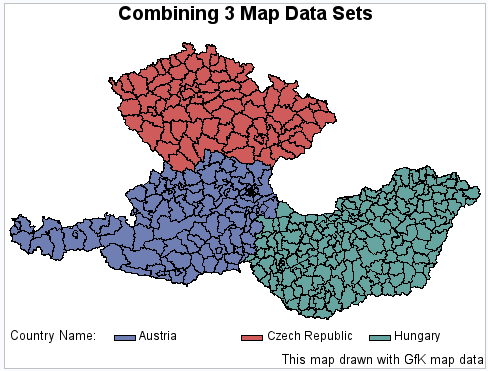 The STATISTIC= option specifies that the GMAP procedure will match the first observation from each of the three MAPSGFK data sets and output the response value from that observation only. The LEGEND= option pulls in the LEGEND statement’s label assignment.